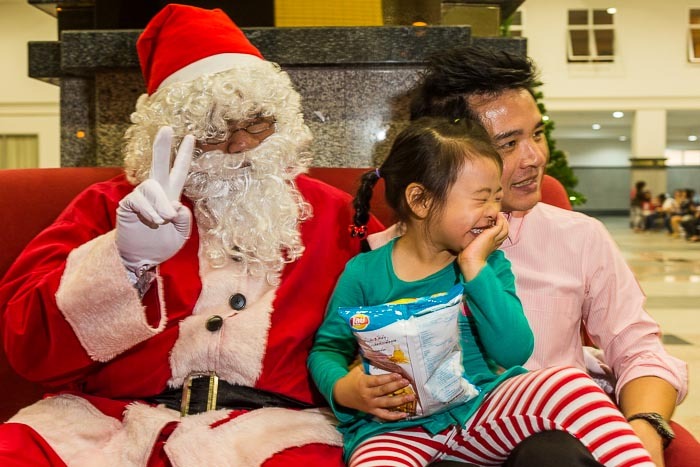 Santa Claus walks through the congregation handing out candies and small gifts at Holy Redeemer Church on Soi Ruam Rudi in Bangkok. 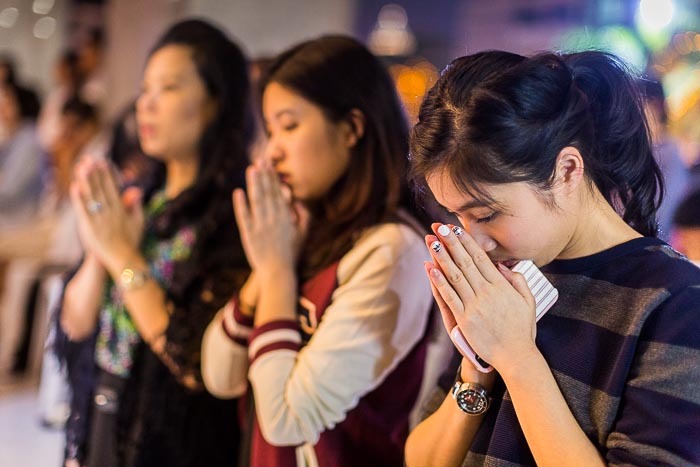 Thailand is overwhelmingly Buddhist - by most estimates somewhere between 80% and 90% Buddhist, but Thailand in general and Bangkok in particular, is also very diverse. There's a huge Muslim population (10% - 15%) and smaller Hindu, Sikh, Christian and Jewish communities. For the most part, people are allowed to practice whatever religion they choose and missionaries, regardless of their faith, are allowed to evangelize here. Christmas prayers at Holy Redeemer. 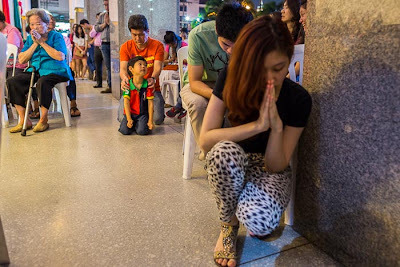 Christians make up less than 1% of the Thai population. A little less than 300,000 of them are Catholic. Christians may be a minority here, but there's a festive celebration of Christmas in Bangkok that rivals anything in the US or Europe. The malls go all out with decorations and lights, Christmas trees sprout from light posts and planters in front of most businesses and many buildings and just about everyone owns at least one Santa hat. A Thai family poses for portraits with Santa. 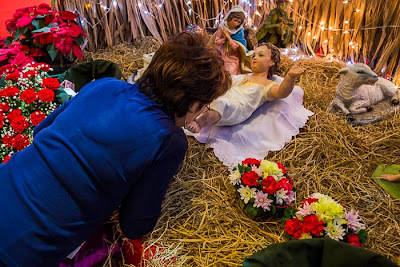 I went to Christmas services at Holy Redeemer Church, a large Catholic community on Soi Ruam Rudi near the intersection of Phloen Chit and Wireless Roads. I made it a point to go to a Thai service to photograph Christmas in Thailand. The church was a veritable winter wonderland. Except with palm trees instead of snow drifts and blinking lights filling in for icicles. There were snowmen, albeit plastic ones, a Santa and a sleigh. No reindeer though. The church was packed with celebrants complete with a children's choir, all wearing variations of a Santa theme. It was so crowded people prayed in the breezeway surrounding the church or stood in the parking lot. 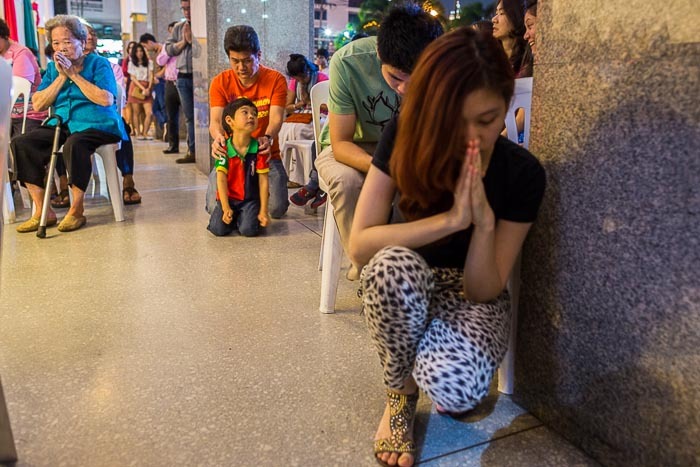 The mass was a regular Christmas mass, except in Thai. 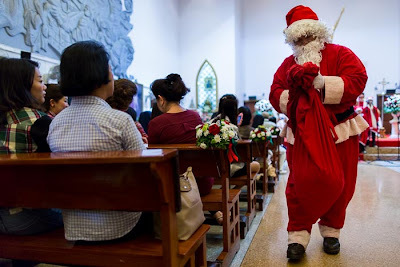 At the end of the mass Santa ho, ho, hoed his way into the sanctuary and walked through the congregation giving out candies and small gifts. Most people waited for the jolly elf to come to them but a few impatient children couldn't wait and went to Santa. People pray and wash the feet of the Baby Jesus (or, more accurately, a doll playing the part of Baby Jesus) in a manger scene in the church. There are more photos of Christmas in Bangkok in my archive or available from ZUMA Press.